Holy Week, the time leading up to Easter, is the most important time of the year for Christians. Everyone is welcome to come to Saint Benedict Parish to experience the life Jesus Christ in a new way. On Holy Thursday, we celebrate Christ’s gift of the Eucharist to his friends and the church. Holy Thursday also includes the Washing of the Feet, when the celebrant ritually reenacts when Jesus washed the feet of his disciples. The night ends with the transfer of the Eucharist to the altar of repose in the Auditorium downstairs. Please note that there is no 9am Mass on Holy Thursday. 11am Children’s Service: An hourlong drama entitled The Tale of Three Trees, that also includes music by the Junior Choir, Veneration of the Cross, and something special to take home with you. 3pm Service: The second part of the threefold Easter Triduum has music by the 11:15am Choir and the Veneration of the Cross. 7pm Stations of the Cross: Music by the 6pm Choir. Good Friday marks the passion and death of Jesus. Walk with Jesus during his arrest, trial, and crucifixion. 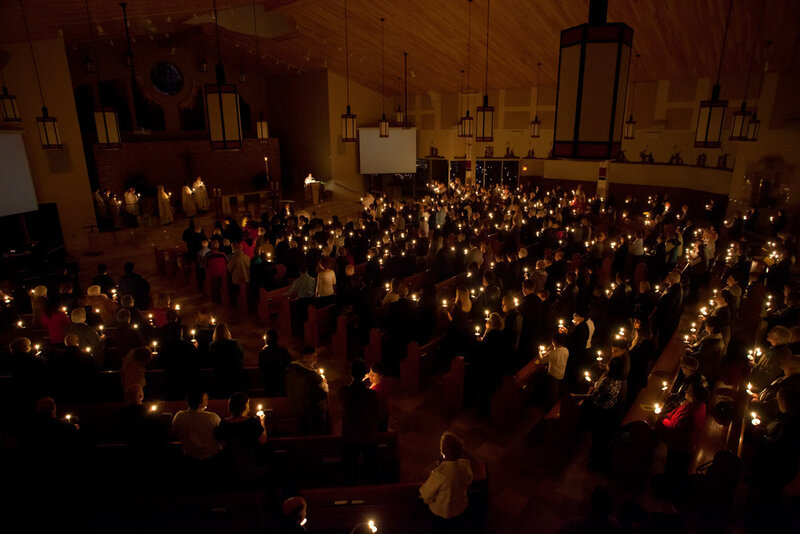 8pm Easter Vigil: Music by the 11:15am Choir. Easter celebrates the resurrection of Jesus. We will be welcoming nine people into the Catholic Church at the Easter Vigil this year. Please note that there is no 4pm Mass on Saturday, and no 6pm Mass on Sunday. The Easter Triduum is the highlight of our year, and we'd love for you to join us for all, or as much of it as possible. See the handouts below for more details on each celebration, or click here to download a PDF of all three handouts.